A leadership conference designed for board members and senior staff focusing on the impact of serving on a board, understanding duties and developing high performance leadership can advance you organization's mission and goals. This session will present purpose of boards, duties of directors, protecting the organization from risk, effective committees, leadership pipeline, relevance to members, strategic direction and board meetings. 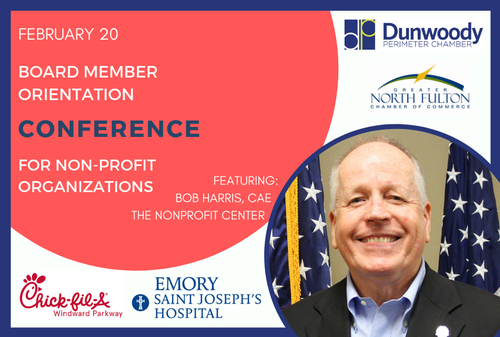 With increased scrutiny on exempt organizations and boards, this session is important for non-profits of any size. Registrants will receive the Board Excellence Manual and the laminated Guide to Board Responsibilities. Attendees are encouraged to bring mission statements, strategic plans or leadership manuals to engage in interactive dialogue. Presented in partnership by the Dunwoody and North Fulton Chambers of Commerce. *Advance registration is required and will end on Friday, February 15, 2019. **No refunds will be given for no-shows or cancellations. Sponsorship opportunities are available for this event. Please contact Stacy Garmon via email or at 678.397.0567.